Bloggers need personal branding for their online businesses. For an example of how personal branding can work to boost visibility in a variety of careers, take blues singer Alexis P. Suter, whose show I happened to catch last weekend at Blast Furnace Blues here in the beautiful Lehigh Valley. At the Arts Quest Center at Steel Stacks Sept. 14, Suter and her band took the stage in the second floor Musikfest Cafe to deliver some sweat drenched blues including renditions of "Knocking on Heaven's Door", which she dedicated to late music legend Levon Helm, and the old Howling Wolf classic, "Built for Comfort." It was a great live performance and shows why Suter and her band have attained such a huge reputation in the industry. But more importantly, it demonstrates how a unique approach can result in the kind of personal branding that will make fans and followers flock to live events, hungrily devour everything associated with that brand, and still keep coming back for more. Imagine your blog was a blues band and you were its lead singer. Would your followers clamor for your autograph, travel distances, and pay money to see your live performances, or buy albums and T-shirts emblazoned with the name of your brand? Check out the video of Suter performing at an outdoor event some years ago to give you a taste of what you've missed and to encourage you to see her live if you get the chance. Wear it on your sleeve. 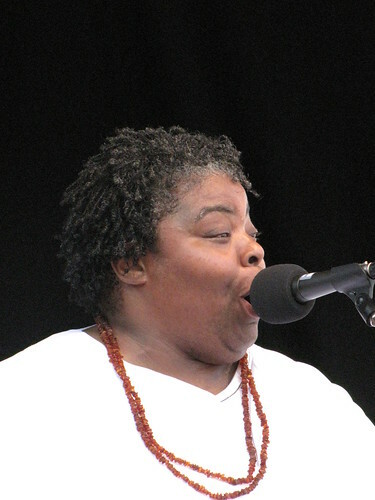 On stage, as well as off I suspect, Suter is an open book, belting out her blues with great passion in a deep resonant voice and sounding as if she is feeling every note and reliving every emotion in her songs. Similarly, good bloggers must be honest with their audience, sharing their passionate interests and the things they love...and even hate. Build trust and empathy. Suter builds a rapport with her audience that makes you believe in her authenticity instantly. You don't need to know her whole story. It's there in her songs. Bloggers should take a similar tack in the posts they write. Speak with authority about what you know and let your audience see you understand where they are coming from too. Be the linchpin. In his book by the same title, Seth Godin describes this as the indispensable person. Suter's band features an incredible lineup including drummer Ray Grappone, guitarist Jimmy Bennett, keyboardist Benny Harrison, bassist Peter Bennett, and backing vocalist Vicki Bell. But it is impossible to imagine the group without Suter, just as it should be impossible for readers to imagine your blog without your opinions, thought leadership, and commentary. So how about you? Have you stepped up to the mic? Be the powerhouse behind your blog and bring personal brand into the equation for your audience and for the success of your online business! I absolutely agree with this. Thanks! The importance of keynote speakers has grown a lot in different types of businesses. The keynote speakers help to motivate the employee's morale, reinforce goals and objectives and boost productivity of any business. A friend of mine, recently found inspirational speaker in Florida, where they are helping in the promotion of the business.